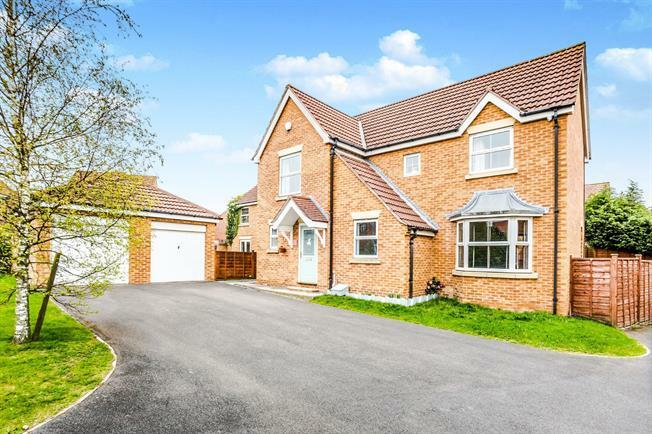 4 Bedroom Detached House For Sale in Wakefield for Offers Over £370,000. Open Day Saturday 27Th April 2019 Between 10Am-11.30Am - By Appointment Only. Spacious and rare to the market this superb 4 bed detached property with double garage and private garden in the prime location of Newton Hill. The property offers a spacious through living room, Kitchen/diner, utility room, study room and w/c and to the second floor is master bedroom with en-suite and 2 x double bedroom, 1 x single room and bathroom. To the front of the property is a drive way for 4 cars leading to a double garage and to the rear is an enclosed good size garden. Viewing is a must as these properties don't come up very often. Spacious through living room with featured fire place and electric fire. Double glazed bay window , patio doors leading to the rear garden, laminated flooring and central heating radiator. Spacious kitchen/diner with fitted kitchen base and wall units with built in oven, hob and extractor. With double glazed window, patio doors leading to rear garden, laminated flooring and central heating radiator. Fitted kitchen base units with sink, plumbing for washing machine and dryer. With laminated flooring, central heating radiator and UPVC door leading to the side of the property. Good size study with double glazed window, central heating radiator and laminated flooring. W/C in white with double glazed window, central heating radiator and laminated flooring. Spacious master bedroom with built in wardrobe, 2 x double glazed windows and views over the rear garden. En-suite shower room in white, with central heating radiator and double glazed window. Double bedroom over looking the rear garden with double glazed window and central heating radiator. Large double bedroom over looking the rear garden with double glazed window and central heating radiator. Spacious single bedroom with double glazing and central heating radiator. Good size bathroom which is part tiled on the walls and full tiled on the floors. Double glazed window and central heating radiator. To the front of the property is a drive way (parking for over 4 cars) leading to a double garage. To the rear of the property is an enclosed lawned garden with small patio area.